Greg Clark, Owl Habitat Coordinator for raptor rescue and rehabilitation group Wild At Heart, talked about the struggle to preserve Arizona’s Burrowing Owls, September 13, 2011, at Desert Rivers Audubon’s monthly meeting. Burrowing Owl visits Desert Rivers Audubon's September 2011 meeting, photo by Linda Covey. A Species of Special Concern, Burrowing Owls live their lives largely in underground burrows made by squirrels, coyotes, skunks and other animals. Small and active both day and night, Burrowing Owls are vulnerable to other birds of prey, animals, and construction. With over 5,000 artificial owl burrows installed throughout Arizona, Greg describds his latest project with Desert Rivers Audubon to install 100 burrows at Zanjero Park, Gilbert. Immediately adjacent to active farmland, Zanjero is an example of the disturbed land on the fringes of suburban areas Burrowing Owls prefer. Desert Rivers Audubon is organizing volunteers to dig the burrows, 8am-2pm, Saturday, October 29, 2011 at Zanjero Park, 3785 S. Lindsay Road, Lindsay Road, South of Loop 202, Gilbert. In the spring, volunteers will again be needed to feed and care for the owls while they are acclimated to the site and before their release. The Burrowing Owl Habitat Project is made possible by a grant from Together Green, an initiative by the National Audubon Society and Toyota to fund conservation projects, train environmental leaders, and offer volunteer and individual action opportunities that significantly benefit the environment. Desert Rivers Audubon and Wild At Heart will also present a technology forum Wednesday, September 28, 2011, as part of the Gangplank Brown Bag Series lunchtime series. Both organizations are seeking advice and brainstorming on social media, mobile technology, and signage to enhance the public’s experience of this Burrowing Owl habitat. “Zanjero Park is considered underutilized by the Town of Gilbert. It is designed for use by horses and there is evidence that horse owners do take their horses there for riding. But, it is not used much for that purpose. It has attractive recirculating water features and two well maintained ramadas that are occasionally used at lunch time by office workers. The main trail around the edge of the park is part of a larger trail used mostly by bicycles. This appears to me to be the main use in the park. There is a nice park bench area and plantings in one area in the middle of the trail. “Because the park is devoid of grass it is not attractive to families with small children looking for a playground. For all these reasons the park doesn’t see much use. But, situated next to farm land, it is perfect for Burrowing Owls. The trail system and park bench would allow easy access to see the owls and small children would not typically be at the park running around and looking for fun opportunities to chase the owls. The low density vegetation will allow the owls good visibility, especially in the large basin area where the release sites are located. 100 burrows are being installed with four release sites. “Once the owls are present the use of the park will go way up as people go to see the owls up pretty close. “The close proximity of Campo Verde High School (adjacent to the park) could provide scientific and educational opportunities for the students via monitoring, owl behavior descriptions, pellet comparison studies with other nearby owl sites, and gathering video and still images for web site reports and creative writing. 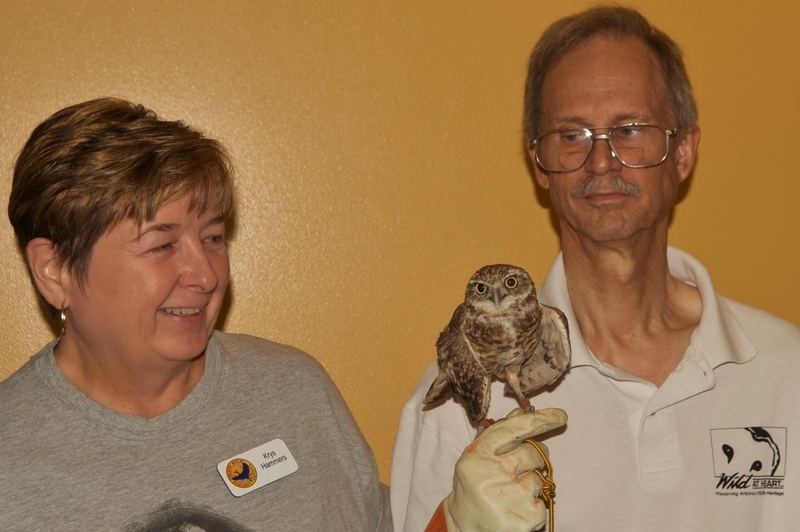 If you missed #OWLDAY, Wild at Heart has another habitat install project, Saturday, November 19, 2011. 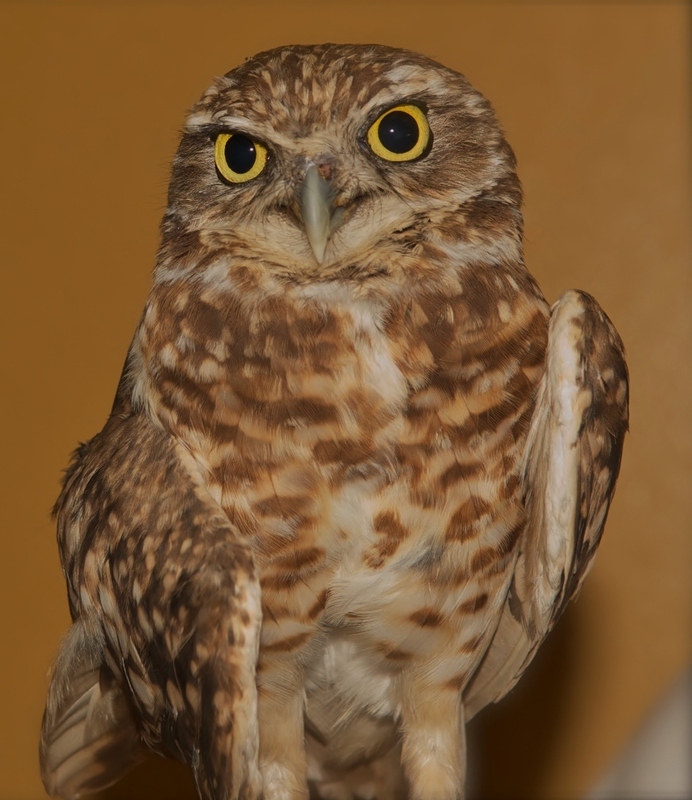 “On Nov 19th we will be constructing new homes for burrowing owls at a farm northwest of Gila Bend. Travel time from Phoenix to the site is approximately 2 hours. “The 400 new homes, or artificial burrows as they are called, are needed to relocate AZ burrowing owls who have been displaced by development and/or loss of their natural burrows and habitat. “Building the burrows consists of placing plastic burrow chambers in the ground, connecting flexible access tubes to the chambers and creating ground-level entrances so the owls can get down inside their new home. We expect these new homes will support many families of owls for the next 20 years. Greg Clark, Wild At Heart Burrowing Owl Habitat Coordinator, joins chapter president Krys Hammers and a rescued burrowing owl at Desert Rivers Audubon's September 2011 meeting. Photo by Linda Covey. We like you, Like us, too!